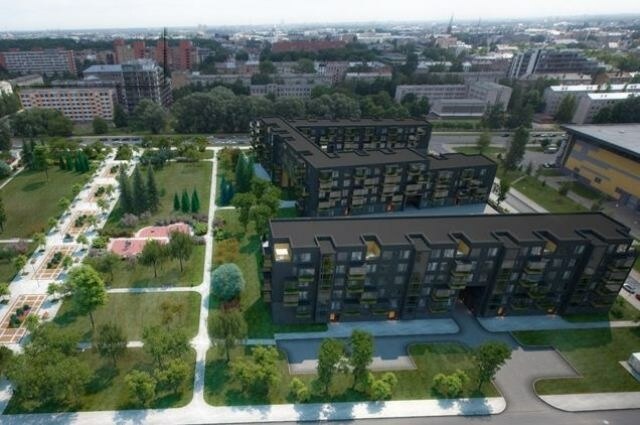 SIA Merks, part of AS Merko Ehitus group, has started the second phase construction of Skanstes Parks residential development at Skanstes district in Riga, which includes two buildings at J. Dikmana 4 and Vesetas 15. The first stage including 52 apartments building at Grostonas 12 construction will be competed at the end of 2016 and the second phase buildings with 85 apartments construction will be completed in summer 2017. Skanstes Parks residential development project (www.skanstesparks.lv) has 137 apartments with sizes between 50-145 square metres. Apartments have spacious balcony, first floor apartments have terrace and the upper floor ones have roof terrace. Each apartment of the energy efficient building is equipped with air-recuperation system, which provides fresh air and ensures inconspicuous air distribution in all rooms. Storage places are located on the first floor and on the underground floor together with parking spaces. Security is assured by separate entrances, video intercom and security cameras on the roof of the building. The price per square meter of the apartments starts from 2,200 euros. Skanstes Parks is located in Skanste, one of the most prospective new areas of Riga. Schools, stores and a park are located in the close vicinity. SIA Merks has built Skanstes Virsotnes and Skanstes houses residential complexes, multifunctional hall Arēna Rīga and two office buildings at Skanstes district. SIA Merks is Latvian construction company, which offers construction services in the fields of general construction, civil engineering and residential construction. SIA Merks is one of the leading residential real estate developers in Latvia.